Hundred school students were provided with school bags, notebooks, and uniforms this year, thanks to Bighelp donors who made this achievement possible. 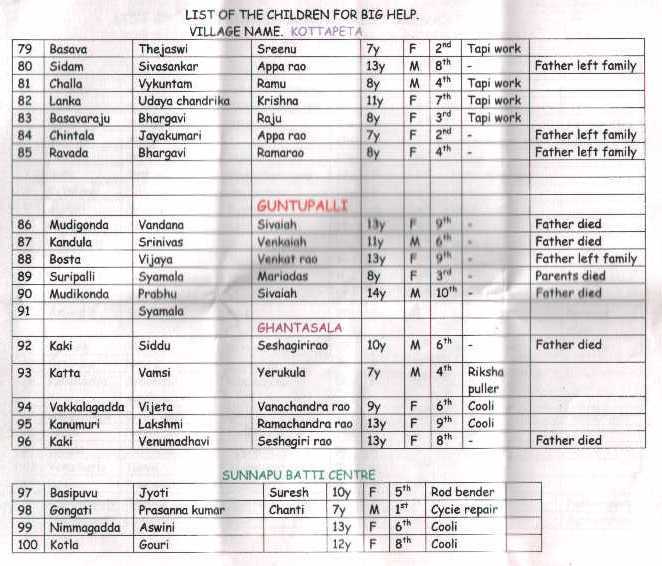 Selected children were from various villages in and around Vijayawada, Andhra Pradesh. Although primary education is free, government schools lack supplementary materials like books, school bags and uniforms. In the face of soaring prices of education materials, students especially those from poor families are finding it difficult to purchase them as per their educational needs. 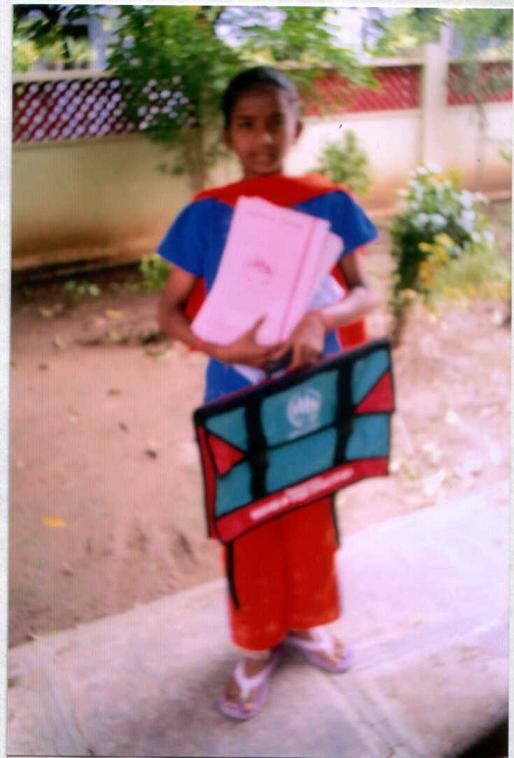 Our Adopt a School program and Arise & Shine, a voluntary organization based in Vijayawada quickly discovered that most effective contribution we could make to these children is through distribution of education materials. Arise & Shine helped in screening hundreds of families and selected the children who were struggling with poverty and those who could not meet their basic educational needs. 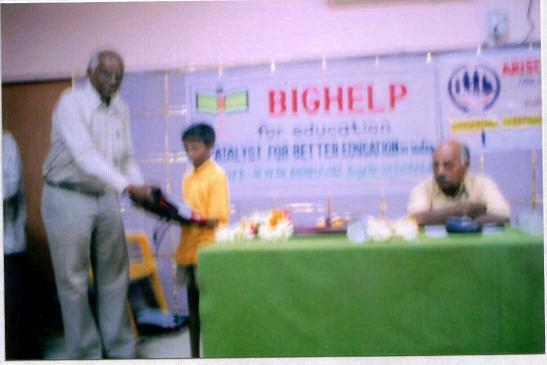 Upon selecting the deserved candidates, a total of 100 students were handed out education materials. These materials are very useful in a way that they motivate children to attend school and improve their education. 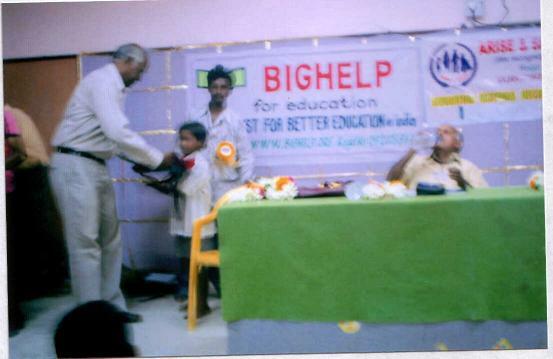 While handing out these materials, Bighelp particularly was happy when some children expressed their happiness. 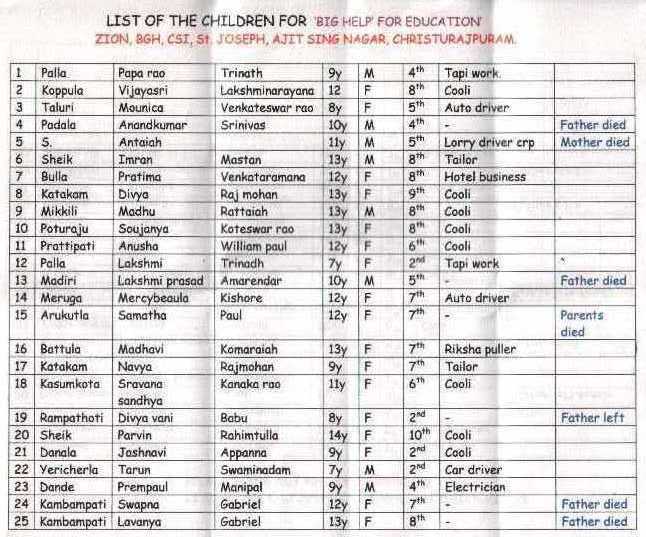 Many of these families are struggling with the cost of education and thus limiting their future options. Bighelp is trying hard to help break this cycle of poverty by providing them educational needs and supporting their future. 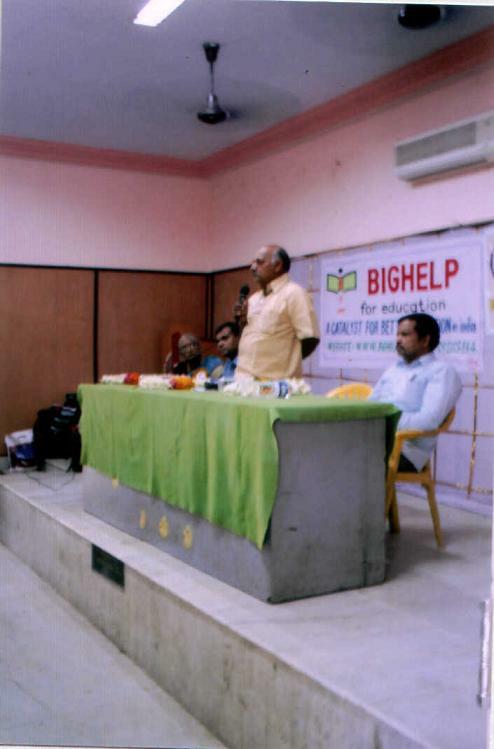 We would like to thank our Bighelp donors for their concerned thoughtfulness and assisting us in our journey. 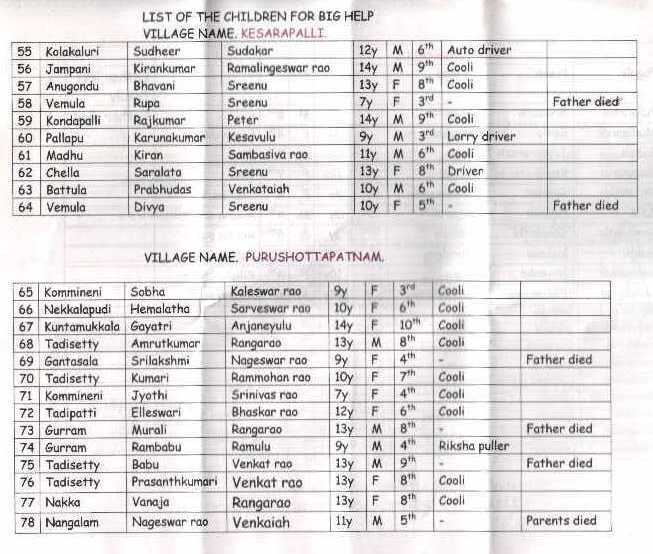 Children are from villages in and around Vijayawada: Kesarapalli, Purushotampatnam, Ghantasala, Kristurajapuram, Guntupalli, Kothapeta, and Sunnapubhattilu. Nearest railway station is in Vijayawada and nearest airport ( ~275 km) is situated in Hyderabad. 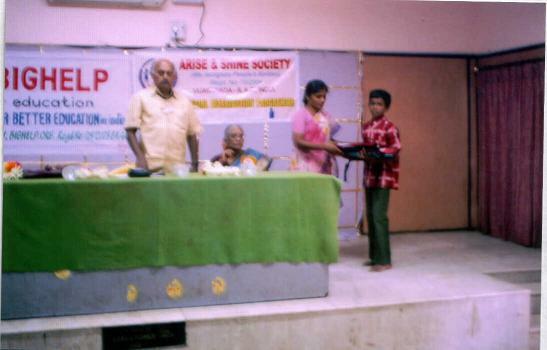 For the distribution of educational materials, Bighelp and Arise & Shine societies organized an inauguration function at Press Club in Vijayawada, AP on July 12th 2007. 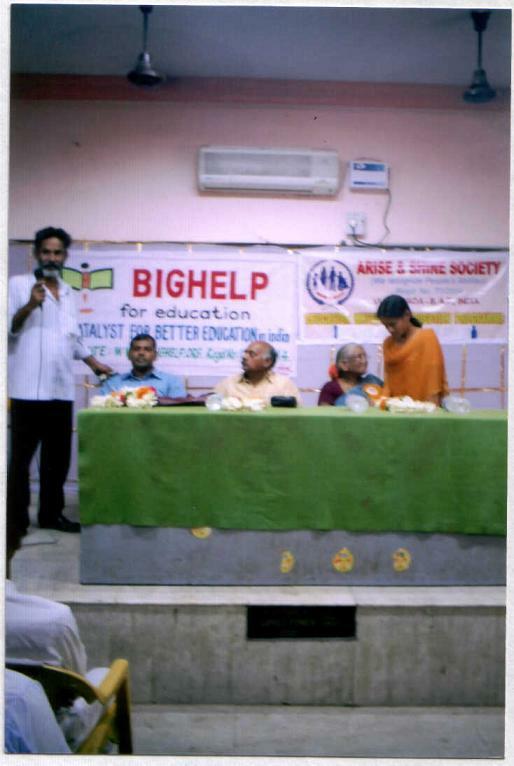 Sri S.Seshagiri Rao, AED (A) of Bighelp , Sri K.Ravindra, Secretary of Arise & Shine Society, Sri J. Venkateswara Rao, Manager of Sri Chaitanya Academy and Smt. 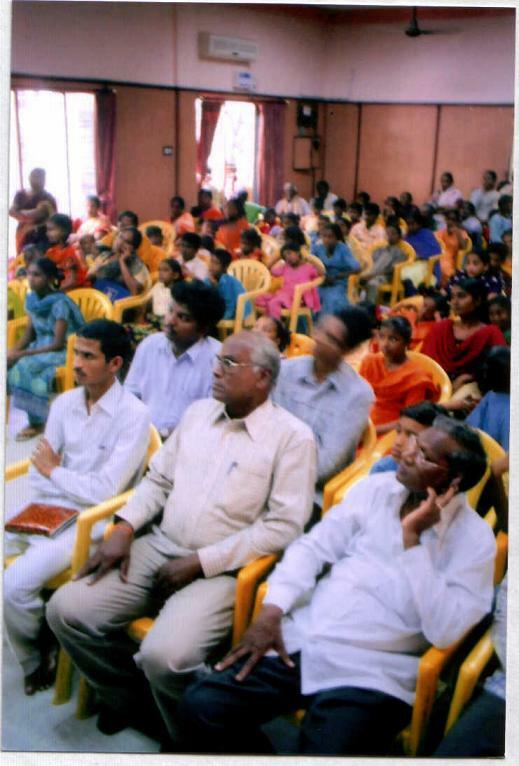 M. Vaidehi, Retd. Head Master were invited to do the honors.